Christina joined SGT as an Ensemble Member in 2013. Her previous credits include: In the Heat of the Night, The Grown Up, The Rose Tattoo, Our Country’s Good, Happy Now, and Romeo and Juliet. 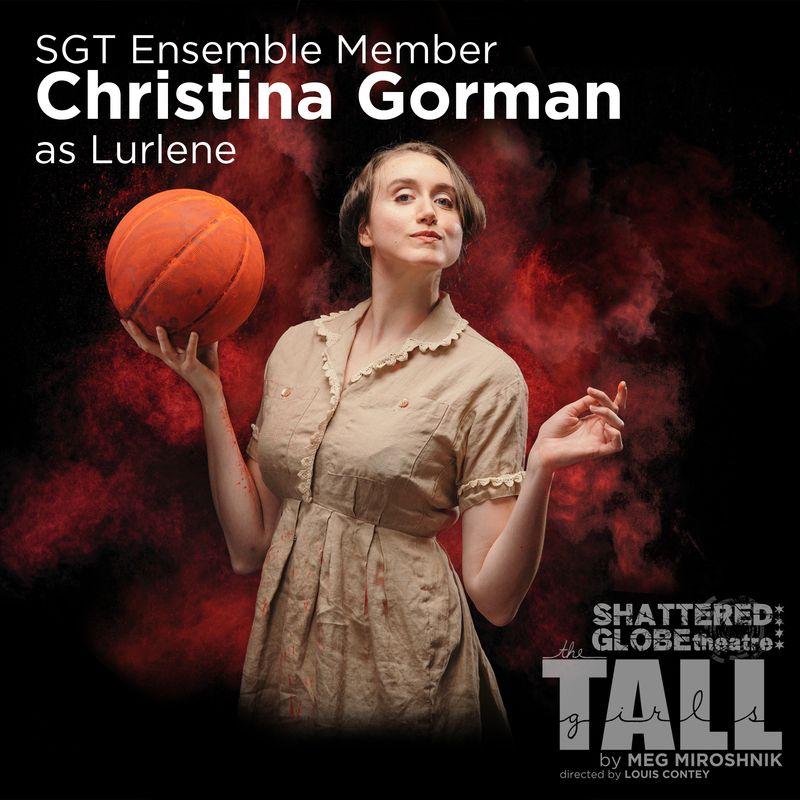 She plays Lurlene in SGT’s production of The Tall Girls by Meg Miroshnik. We asked her some questions regarding learning to play basketball and what it adds to her experience onstage. Did you have any basketball skills before starting this process? Very little. I played HORSE with my dad when I was 12. And I knew how to dribble…but, that’s about it. Are you more of a basketball fan than now? Absolutely, I think I am more of a fan of playing it than I am watching it though. I’ve never been very good at watching sports. Is it challenging to play basketball as part of a show? Definitely yes. I have a fight background, so I am no stranger to doing physical/movement oriented things onstage. But, this is different entirely. With stage combat, everything is carefully and thoughtfully choreographed. With this show, although great care and thought were put into our basketball sequences by our director, assistant director, and our terrific basketball consultant, there is necessarily an improvisational element to it based on the simple fact that our choreographed plays do not always go as planned. Like in real life, the ball doesn’t always go in the hoop. We’ve never had the same show twice. I would say, depending on the day, 30%-40% of our basketball sequences are really us playing basketball. Just when we think we’ve experienced every unexpected thing that could possibly happen, something new will occur. One night the ball got stuck between the backboard and the rim of the hoop. Don’t know how that could possibly happen, but there it was. Is there anything you’ve personally gained as a result of working on this production? I think the thing that I treasure the most out of this experience is how much this show has truly pushed me to ‘live in the moment’ more. I think it’s one of the things actors chase the most onstage, not thinking about what’s just happened, what’s happening next, but truly just being present. I know that sounds obvious, but it’s not always easy. Having to play basketball and work as a team not knowing if we’ll make the shot or not forces you to focus moment to moment in a way I’ve not experienced onstage before. And, living in the moment offstage ain’t such a bad skill to practice either. The Tall Girls by Meg Miroshnik plays thru February 25 at Theater Wit (1229 W Belmont, Chicago, IL). Single tickets are available via the Theater Wit Box Office. More info about Season Traveler Memberships–the best way to see all three shows in SGT’s 2016-2017 Season–are available here.